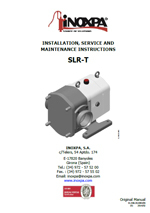 The SLRT pump is a positive displacement rotary lobe pump designed to discharge food and sanitary products from a truck cistern as it can be driven by a hydraulic motor. 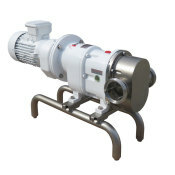 The pump is characterised by a compact design, reduced weight and interchangeable connections to facilitate its assembly to a truck. 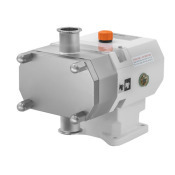 The rotary lobe pump SLRT pump is designed to pump liquid products with or without delicate solid particles that require gentle pumping causing no damage to the product. The SLRT rotary lobe pumps basically consist of bi-lobe rotors which rotate synchronously inside a casing without touching each other. 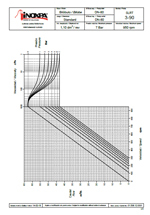 As the rotors rotate, the spaces between the lobes and the casing are successively filled with the product and a fixed amount of the displaced product is conveyed to the discharge nozzle. The pumped product forms a continuous flow thanks to the clearances between the lobes and the pump casing, thus, ensuring an efficient pumping. The pump casing and the lobes are manufactured in stainless steel. The design of the attachments of the lobes is sanitary. The shaft is hollow with spline SAE 6B 1˝. 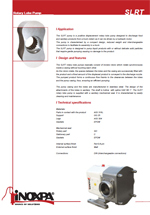 The SLRT rotary lobe pump is supplied with a sanitary mechanical seal. It is characterised by easily cleaning and maintenance. Mechanical seal: SiC/SiC or TungC/SiC. Relief valve on the front cover or external bypass. Bare shaft for electrical drive. Summary Кулачковый насос SLRT представляет собой объёмный насос санитарного исполнения. Данный роторный насос предназначен для перекачивания пищевых продуктов из автоцистерн. Summary Las bombas lobulares SLR-T de INOXPA forman parte de nuestra extensa gama de bombas rotativas de desplazamiento positivo para líquidos viscosos. 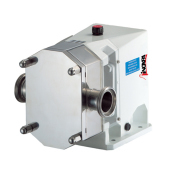 Summary INOXPA's SLR-T lobe rotor pumps are part of our extensive range of positive displacement rotary pumps for viscous liquids. Summary Les pompes à lobes SLR-T d’INOXPA font partie de notre vaste gamme de pompes rotatives à déplacement positif pour liquides visqueux.